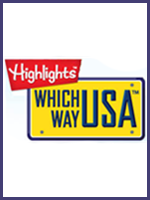 The Homeschool Buyers Co-op is pleased to present the best deal on the planet for Spanish and French foreign language curriculum at deep discounts from the award-winning Whistlefritz®. Whistlefritz teaches children in grades PreK - 2 Spanish and French in the same way they learned their first language: through words used in context by live speakers in fun skits, games, catchy music, and dance. 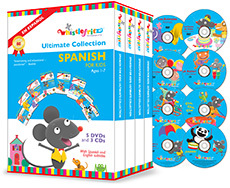 Whistlefritz's award-winning French and Spanish DVDs and CDs teach children languages using the "Language Immersion" method. With language immersion, children learn a second language by hearing and speaking only that language without translation. No English is spoken. Research indicates that language immersion is the most efficient and effective way for children to gain fluency in a language. 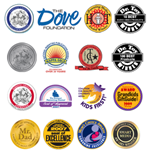 Visit the Whistlefritz website for more information. Listen to sample Spanish and French CD tracks. 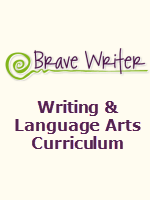 Watch a video for more information on "Language Immersion". Fulfillment: Within minutes of order placement, the Co-op will forward your order to Whistlefritz for processing. Whistlefritz will ship your order within two (2) business days. Please allow an additional 5-7 business days thereafter to receive your product. We are sorry! This offer is open to US and Canadian Members only! Shipping: Your order will ship via USPS. The shipping charges will be as follows for US Members: The Deluxe Collection, The Complete Spanish Collection, and The French Collection - $9.50. The Educators Collection - $12.00. For Canadian Members, shipping charges are $15.30 on any product. Note: Whistlefritz is not responsible for any customs fees assessed by receiving country. Returns/Cancellations: In order to bring you these great prices, we cannot accept cancellations. You may return new, unopened items sold and fulfilled by Whistlefritz within 30 days of delivery for a refund, minus the shipping cost. Member is responsible for the return shipping cost to Whistlefritz. If the return is a result of Whistlefritz's fulfillment error (incorrect or defective item), you may return for a replacement. The Educator's Collection provides a rich and diverse set of tools for Pre-K and early elementary Spanish teachers. 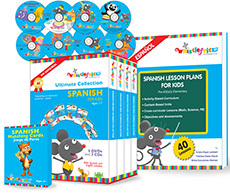 Spanish Lesson Plans for Kids is a scaffolded curriculum of 40 reproducible lessons that engage children in a diverse array of interactive, age-appropriate activities. Three (3) Spanish for Kids CDs get children on their feet singing and dancing to an irresistible mix of Latin songs and rhythms. CDs include: A Bailar! Let's Dance!, Cha, Cha, Cha Spanish Learning Songs, Sabor! The Matching Cards are a playful introduction to action words. Packed with fun, laughter, and music, the Educator's Collection is a treasure trove of teaching activities and materials for the Spanish classroom! Give your child the gift of language with the entire award-winning series of 5 Spanish DVDs, 3 CDs, and memory matching cards! Spanish for Kids CDs keep the language fun going with an irresistible mix of Latin songs and rhythms that get children on their feet. CD titles include: A Bailar! Let's Dance!, Cha, Cha, Cha Spanish Learning Songs, and Sabor! Matching Cards: At home or on the go, the Matching Cards give the classic memory game a playful new twist. Packed with fun, laughter, and music, The Deluxe Spanish Collection is an ideal introduction to Spanish! Includes lyrics, translation guide, and Spanish subtitles. Note: This Collection does not include the Matching Cards. Three (3) Spanish for Kids CDs: A Bailar! Let's Dance!, Cha, Cha, Cha Spanish Learning Songs, Sabor! 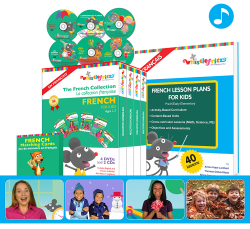 Enrich your French instruction with the award-winning, multi-media Educator’s Collection (French) from Whistlefritz. The Educator’s Collection (French) provides a rich and diverse set of tools for Pre-K and early elementary French instruction. Packed with fun, laughter, and music, the Educator’s Collection (French) is a treasure trove of teaching activities and materials for the French classroom! Book French Lesson Plans for Kids: Developed by creative and experienced educators, French Lesson Plans for Kids is a scaffolded curriculum of 40 reproducible lessons that engage children in a diverse array of interactive, age-appropriate activities. Memory Matching Cards: The Matching Cards are a playful introduction to action words. Four (4) French Immersion DVDs: French for Kids videos teach vocabulary through an appealing blend of live action and animation ideal for visual learners. DVD titles include: "Dedans et Dehors (Inside and Out)", "On Va Jouer (Let's Play)", "Les saisons (The Seasons)", and "L'anniversaire de Fritzi (Fritzi's Birthday)". Two (2) French for Kids CDs: French for Kids CDs get children on their feet singing and dancing to an irresistible mix of upbeat songs and rhythms. CD titles include: "Cha, Cha, Cha" and "Allons Danser! (Let's Dance!)" Six lively programs encourage children to speak in French, sing in French, even dance in French! This multimedia set includes the French immersion DVDs "Dedans et Dehors (Inside and Out)", "On Va Jouer (Let's Play)", "Les saisons (The Seasons)" and "L'anniversaire de Fritzi (Fritzi's Birthday)". 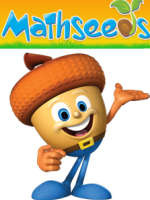 Created to be enjoyed again and again, each DVD encourages children to learn basic French vocabulary as they interact with vivacious host Marie, playful peers and charming animated characters. The fun continues with the lively CDs, "Cha, Cha, Cha" and "Allons Danser! (Let's Dance! )", that combine catchy original songs and traditional favorites with rollicking world music rhythms. Give your child the gift of language with the entire award-winning series of 4 French videos, 2 CDs, and memory matching cards! Four (4) French Immersion DVDs:From numbers and letters to the seasons and birthday parties, the French for Kids videos offer a playful blend of live action and animation. 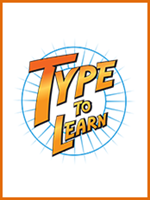 The videos teach French using the immersion teaching method recommended by language acquisition experts. DVD titles include: "Dedans et Dehors (Inside and Out)", "On Va Jouer (Let's Play)", "Les saisons (The Seasons)", and "L'anniversaire de Fritzi (Fritzi's Birthday)". Two (2) French for Kids CDs: French for Kids CDs keep the language fun going with an irresistible mix of songs and rhythms that get children on their feet. CD titles include: "Cha, Cha, Cha" and "Allons Danser! (Let's Dance!)" Memory Matching Cards: At home or on the go, the Memory Matching Cards give the classic memory game a playful new twist. Packed with fun, laughter, and music, The Deluxe French Collection is an ideal introduction to French! Includes English and French subtitles.